Osmosis: Metaplasia and dysplasia. (2019, April 20). Retrieved from (https://www.osmosis.org/learn/Metaplasia_and_dysplasia). Metaplasia (Greek: "change in form") is the reversible replacement of one differentiated cell type with another mature differentiated cell type. The change from one type of cell to another may generally be a part of normal maturation process or caused by some sort of abnormal stimulus. In simplistic terms, it is as if the original cells are not robust enough to withstand the new environment, and so they change into another type more suited to the new environment. If the stimulus that caused metaplasia is removed or ceases, tissues return to their normal pattern of differentiation. 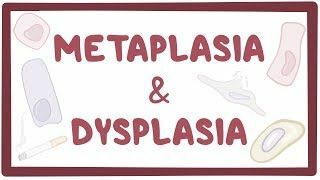 Metaplasia is not synonymous with dysplasia and is not directly considered carcinogenic. It is also contrasted with heteroplasia, which is the abnormal growth of cytologic and histologic elements without a stimulus.